and then where to even begin? as inspired by what katie ate & call me cupcake! note: this is one of the easiest desserts ever. egg whites + sugar whipped into a frenzy and then baked. next time i make this, probably for blueberry season, or peaches, i would cut back on the sugar. use your best judgement, defer to how sweet the berries are already. preheat oven to 350F, take out middle rack, leaving just the bottom rack. on parchment paper, measure out how big you want your pavlovas. i used a jar lid as guidance. 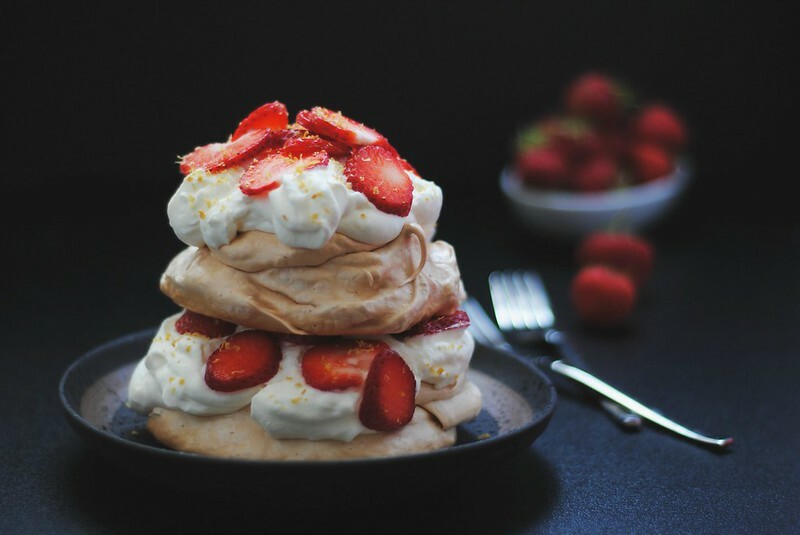 give the pavlovas space, as they do spread out while baking. flip parchment paper over on cookie sheet, your penciled outline will still be visible. set aside. in a mixer, whip up the egg whites until foamy at medium speed. slow down the speed a smidge and slowly add in the sugar until fully incorporated. you’ve reached perfection when you can turn the bowl over and nothing slips out. add in the white vinegar + corn starch and gently stir until fully mixed. if you’re aiming for 4 pavlovas, mentally divide the batter into four and scoop out onto the outlined circles. with a large spoon or off set spatula, spread out the mounds. next time i’ll press down in the middle a little, to provide a good platform for the cream + fruit. prior to putting in oven, turn it down to 250F. bake pavlovas for 1:15. at no time do you open the oven door. turn off the oven, do not open the oven door. 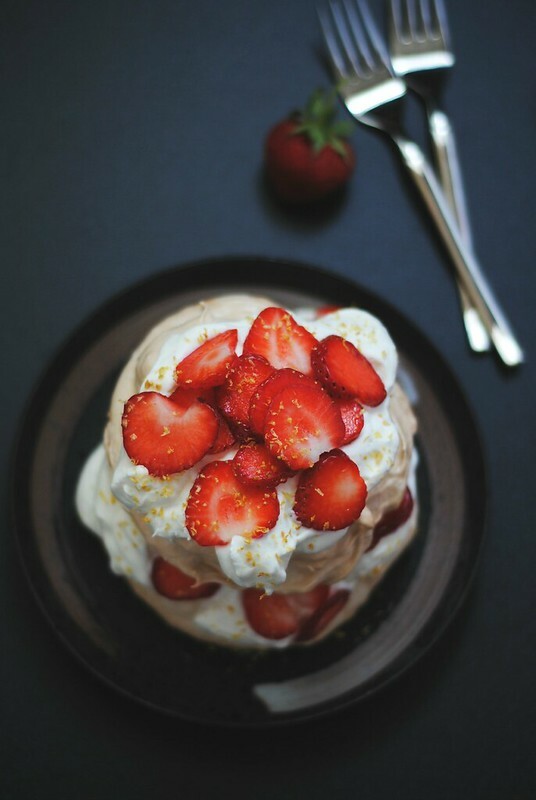 allow the pavlovas to cool down, ideally overnight. when ready to serve, whip up the cream + powdered sugar. the way i made this, it can serve 4 people (or 8 if sharing…) but instead, since it’s just me + dw, it serves us, on two different occasions. first time: lay one pavlova on plate. dollop, generously, with whipped cream. top with sliced strawberries and sprinkle with zest, if using. add to that mess creation, another pavlova. dollop again with whipped cream, topped with sliced strawberries & sprinkle with zest. inhale. 2nd time: just as single serving, layered with whipped cream and strawberries. 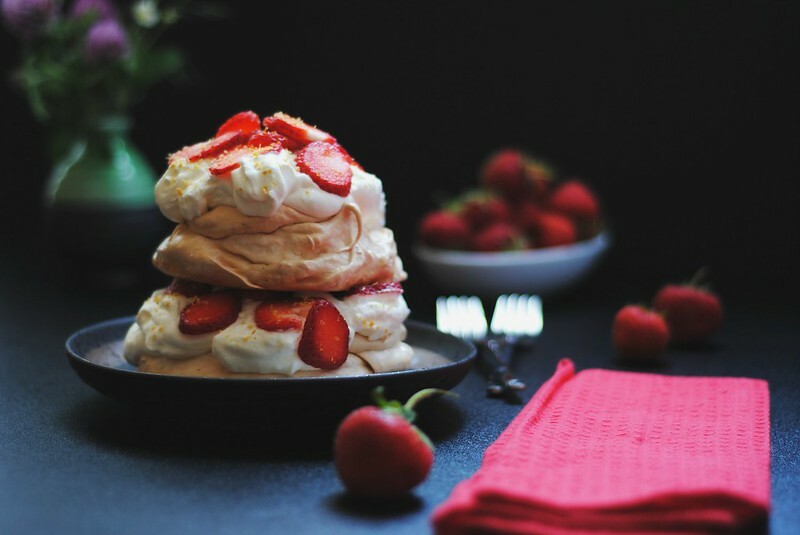 Beautiful pavlova, I want to eat this every day of summer! 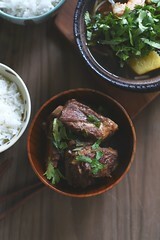 i would also like to eat this everyday. This is so gorgeous and looks perfect for summer – strawberries and cream are such a timeless combination! yes, strawberries + cream is one of the best combos. Your instructions for the meringues are perfect! My mom taught me to let them sit overnight in the oven — even in always-drizzly damp Oregon, they come out perfectly 🙂 I love the way you shot these! Pavlovas are one of those beautiful messes! I’m so glad strawberry season has found you. I know the feeling of…. the season is so short…. how will I make the most of it…..?!?!?! 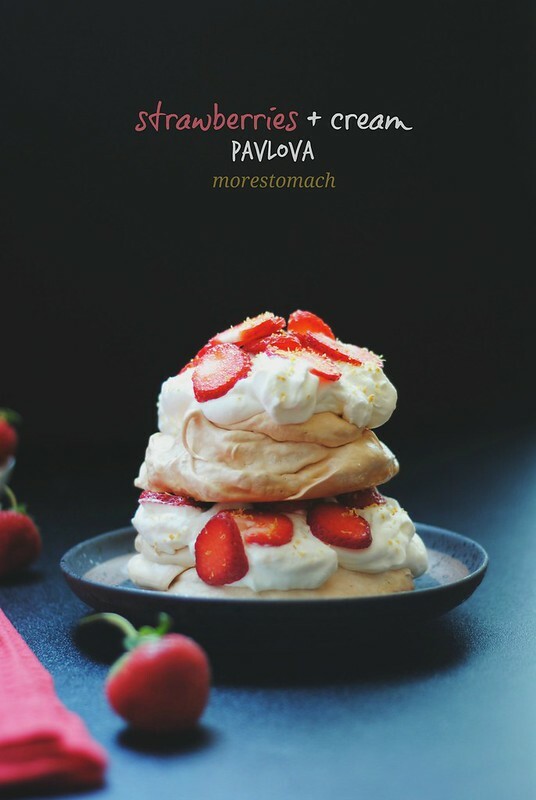 sophie, i am so in love with pavlovas right now, i’d eat it everyday if i could. This look amazing Lan, love strawberry season. This is something so different for me, pinned to make when we have guests. Very impressive! cheri, please do let me know how they turn out for you. this is such a wonderful mess of a dessert, and so easy to put together. ilke, it really is the most perfect summer treat. i hope you’re able to get ahold of some in spain & turkey soon! Thanks for the link love 🙂 Made mini pavlovas today (will assemble them tomorrow); definitely a summer favorite. Yours looks beautiful! i really couldn’t tell you. it would give it a lovely pink hue though, methinks.